It’s wedding season! For those of you who are planning a wedding for next year (congratulations! ), this area is home to several beautiful, functional locations that are perfect for wedding ceremonies, receptions, and also has a wide variety of lodging for family and guests. The Lincoln Chapel: The beautifully restored Lincoln Chapel is located inside Lincoln Boyhood National Memorial. If you’re interested in sharing your big day in a significant, historical location, this chapel is perfect for a ceremony of smaller size. 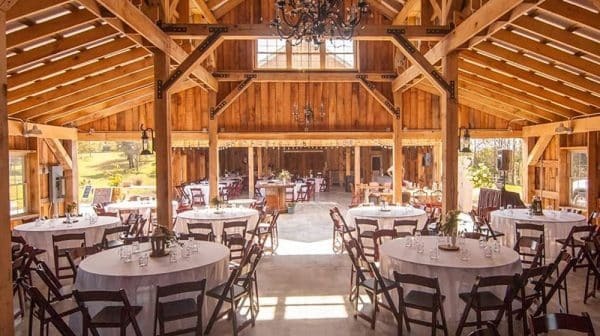 Monkey Hollow Winery and Distillery: Nestled in the rolling hills of St. Meinrad, Monkey Hollow Winery is a lovely location for an outdoor wedding accommodating approximately 100 people or less. You can have your ceremony under the natural, flowing canopy of a weeping willow tree or overlooking the lake. Corner House Bed & Breakfast: The one-stop shop for weddings, this bed and breakfast offer lodging, beautiful bridal suites, homemade breakfast, stunning country scenery for photos, a picturesque ceremony site, and a newly added event barn for the celebration after the ceremony. The owner also happily provides professional floral arrangement services and with fresh cut flowers, if desired. Santa’s Lodge: This venue will accommodate about 300 guests. Here, you can have your wedding ceremony lakeside in the gazebo, dance the night away in the Celebration Room, and then enjoy a good night’s rest after your big day, all in one location. The lodge offers numerous rooms for the rest of the family, too. To find more local lodging options for your guests and family, visit the accommodations page on our website. This post was updated from May 2016.